I think my favorite part in RPGs is the character creation, so here's a character creation game! I like your sense of humour. There could well be a fully fleshed game in the 'trying to deal with real world problems like in an RPG' concept. I don't know that this game is still supported, but would you/someone be willing to offer some suggestions to get it running? I've tried every combination of driver & filter, but keep receiving an error screen. I suspect that this may have to do with my monitor having an unusual aspect ratio (5:4), but I'm not sure how to address the problem. I find the ending interesting, but maybe not so well executed. 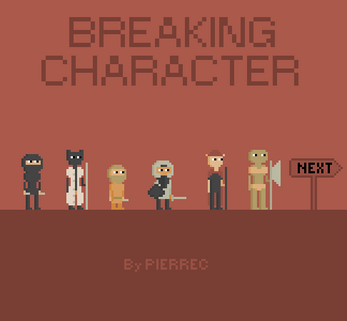 My impression is that Breaking Character is a very short and pretty simulator with trollish humor. I'l glad the summary says it's about character creation and hints that that may be all. But it also describes it as a game. Not as a 100% linear kinetic novella. Which means there's supposed to be, y'know, at least one variable variable involved in the code, beyond the static clickable sprites and few lines of text. Returning to the title screen would have been more artsy and less jarring. Even better and still simple, witting a last line of dialogue from the second character hinting at passing of time before returning to the title screen if the player stays, and only closing the window itself if the player leave would have brought a clever and deep message left to be interpreted openly though roleplay. Otherwise, even the theme of roleplay has yet to be found in this seemingly interactive novel. That must crash at last step? I had a good laugh with this game! Kind of wished it had a different ending, but overall it was still really funny. Disappointing that the game seems to end in a crash no matter what. None of the choices matter. It's a fine way to end the game, but it's not clever. I think you should finish it. This game is really cute. The commentary is clever and the underlying story is equal parts sweet and heartbreaking. Thanks for the game! I cant get past the NEVER leave or comeback part. How do I actually play it? A rather fascinating game. Kinda wish there was more to it, but I enjoyed it! Good game, ignore the haters. Loved the ending, leaves much to the imagination lol. You could have at least had a message at the ending or something. The game just closing made me kind of irritated. Prior to that it was fun, like a genre or game making fun of itself. Just wish there was more to it. Meh. I played and then at the end I chose to never come back, the game crashed. I paid a dollar I played 4 min...then it failed. Hi. The game is supposed to stop after the character creation, it's a kind of joke game. I'm sorry you were disappointed. If it can be of any comfort: I didn't get a single cent from that dollar: every "revenue" from my games is given directly to itch.io. if you didn't like the game, you still can tell yourself you supported an awesome game platform!